"And they do talk some nonsense! One at least two separate occasions I had to ask for quiet while I threw my ball!". Quite uncertain as to this being correct terminology, however had no time to query, as Mrs Payne continued saying could not give up, as everyone so fearfully kind! Also, they had cake. "You'll have to bring cake.". Other half positively thrilled to the core as told her of mother's destination. Said she was ever so sneaky, would have to be taught a lesson. "Oh, it is! We could play a GAME on such fine GRASS!". At this Mrs Payne shifted rather in her seat, as other half and I looked at each other with delight. "I GIVE UP, I'VE BEEN PLAYING BOWLS! Would you kindly BE QUIET!". "Oh, say. I had better empty the bin. How silly of me. Yes, I will do that now.". Most surprised as other half grimaced during this performance, which turned into sickly smile as Mrs Payne looked at her altogether confused. "I better be going. Sometimes your Robert is a fearful idiot.". "Tally ho? You're not on a bally boat!". Thankful to say no further accosting took place, and having kept up, saw Mrs Payne reach her destination! Ever so excited to tell other half, and shall write not a jot more until I do. Writing early again this morning, as attempting another plan to follow Mrs Payne. Other half rather annoyed yesterday with me having lost Mrs Payne. Said had a jolly good mind to demote me to 006. When enlisted to help with 'intelligence', had rather hoped for a bit more of it! Thought this distinctly rough. "Right, 006! To your preparations!". Altogether displeased as this reduction in number. Followed silence for a few moments, at which other half said I was a darling and looked terribly disappointed, was promoting me to 007 again. Said I should jolly well think so as we embraced. Awfully nervous earlier this morning as waited for Mrs Payne to make her move. M looked altogether unmoved, gave me steely look of determination, bound to say was quite nerving! "Get to the bally door, 007!". "I say Robert, you're not taking this very seriously.". Once message understood, set off altogether stealthily after Mrs Payne. Stopping at front of house however, saw not a jot of her. Looked around with awed surprise. Mrs Payne had vanished. Have written diary entry early this morning. Explained to other half yesterday evening of plan to follow Mrs Payne, as altogether peculiar regards her going out all day. Other half said was quite ridiculous and most silliest of ideas. Could she be involved? Explained I thought it rather like James Bond, 007. At this other half exclaimed she could be 'M'! Said I rather thought her Moneypenny. This vigorously denied, said she was M.
Organised plan such that should Mrs Payne totter off this morning, other half would spy from front window, whilst I would carefully follow having exited from back door. Would communicate by way of mobile telephone as to progress. This having been agreed with much excitement, other half said I did not have licence to kill, but rather licence "not to knock the bally bin over this time". Settled yesterday, as Mrs Payne meandered away, that would jolly well find out her whereabouts should Mrs Payne disappear after breakfast again this morning. Made quite clear cared not a jot for Mrs Payne's whereabouts at breakfast, asking not a thing about her morning. Instead, quietly plotted how I should go about tracking her. Bound to say, as I weighed the various exits to our home, felt ever so like James Bond, 007. "I say, Robert! What the bally!". "Is everything alright, dear?". Followed quite some conversation, shouting down drive Mrs Payne commented as to me being a fearful idiot, as I slowly got up and stalked into house in utmost fury. Quite certainly James Bond, 007, does not have such frightful mother-in-law. Mrs Payne returned yesterday afternoon looking altogether warm, and saying not a jot about her activities. Made terribly subtle attempt to pry information, queried, by the by, had she found the weather pleasant this morning? Most displeased as Mrs Payne ignored this entirely, asked where her newspaper was. Not as much as a glimpse of Mrs Payne this morning, most odd as out all morning and newspaper barely touched. Looked over it whilst having rather extended mid-morning tea break, and came across crossword, half-complete, abandoned by Mrs Payne at breakfast. "S A G G I N G". Bound to say remainder of crossword ever so difficult and quite certain entirety of Mrs Payne's answers most ridiculous. Shall query the sagging later. Most strange this morning, as after breakfast Mrs Payne said was going out, with query as to wanting lift into town nonchalantly denied. Disappointed at this as rather fancied going to coffee shop. "The ones that make the coffee come out.". Thought better of going into town so will wait for call from boss. "Light up like a merry-go-round. ", could see stripes when eyes closed! With some annoyance, most unreasonably blamed me for suggestion on paper. Further, chest of drawers having been removed, now had not a jot of space for clothes, fearfully inconvenient. Thinking better of defending this tirade, escaped by way of saying was going to start work. "You do know it's the same colour it was originally?". Decorator quite finished by yesterday afternoon, having drank one final tea, as was parched, saw about payment and left. Standing in her room, Mrs Payne said was terribly expensive, quite some hundreds of pounds, but was worth it. Replied I needed some air. "Is it nice?". Bound to say had not a word to say in response, merely stood open mouthed searching for the words. Finally managed a "Hmm! ", as other half climbed stairs. "Doesn't it look lovely! I helped!". "I think I feel sick.". "Is the light a bit stripy in here?". Decorator arrived this morning about Mrs Payne's bedroom. Had barely stepped through door when asked about cup of tea, was parched. Tea having been provided, Mrs Payne showed chap to the room, and after some further complaint about wood chip, left him to his task. "She asked if she could help.". "Wait until the yellow paint is up! It'll really set it off!". Came out of office yesterday afternoon and most surprised to see tradesman upstairs in frightful attire, positively covered in paint spots and swearing liberally. Mrs Payne said with excitement decorating would be done awfully quickly, chap was terribly professional! "Can I have half and half?". "I say! I'd like three feature walls!". Heard quite fearful cry from Mrs Payne this morning, and rushing to make sure had not caused herself a mischief, bore full brunt of quite furious complaint at drawers in middle of room, had stubbed her toe again. Bound to say had not jot of sympathy, as had put drawers in middle of room herself, and said as much. Came down mid-morning for tea and found Mrs Payne sat on sofa reading newspaper, positively without a care. Queried as to progress on room and was told with utmost pleasure would be done shortly. Bound to say barely thing had been done. Chest of drawers had been moved into middle of room, although was aware of this already, from much oofing heard from office earlier. Behind drawers, Mrs Payne had begun peeling off existing wood chip wallpaper. Looking to have peeled off some few inches at the bottom of one piece, the work had evidently stopped. Further up wall some additional attempts had been made with scraper, now resting on floor with few snowflakes of wallpaper as evidence of work. "Oh, it was a dream.". Mrs Payne most excited this morning, with all painting items on kitchen table whilst Mrs Payne showed other half. Bound to say most annoyed as tried having breakfast around various items. Almost spread butter on toast with putty knife. Other half rather feigned interest at various colours, said was room not going to be rather bright? Perhaps should leave cream wallpaper as it was? This vigorously denied, was told room would look terribly jolly! Also said with excitement, had got quite excess of yellow paint, as large tub awfully good value, could paint whole house! Having almost choked on toast, said was time for work. "Oh, I say! That would look lovely!". Explained on numerous occasions would certainly not be putting a bird bath, hanging basket, or bidet in her room. Seemed most disappointed. "Yes! I need new wallpaper!". Followed awful journey around shop, with me querying various items would perhaps need to afix wallpaper. Begged her pardon, but how was she intending to stick wallpaper to wall? Mrs Payne quite stopped at this, looked at me squarely, said I was a fearful idiot, was using flour and water! "Yellow it is! That would look lovely!". Received quite frightful shock this morning as Mrs Payne said over breakfast, would I be so good as to take her to decorating shop? Positively had heart attack as Mrs Payne explained I had said would like her to stay, and stands to reason would want her to be comfortable, so would need to make one or two changes to furnishings. "Now! To find my hammer!". "That jolly silly stool". Begged her pardon, but had it not been her that moved this from opposite side of room such that could rest her foot on it to minister various ointments, which, by the by, had noticed quite quantity of on fabric? This query duly ignored, Mrs Payne continued with utmost vigour and had not a jot of silence to read Sunday newspaper. Received list of quite travesties to interior decorating ethos, and bedroom altogether unsuitable. Suggested perhaps Mrs Payne would prefer room at nursing home, had number quite safe should we need to call. Mrs Payne most displeased about this, said thought of spending more time with old people quite fearful. Said rather upset that was as if I didn't want her to stay! Laboured under duress of other half's stares, certainly wanted her to stay! Of course! Why wouldn't I! Spending time with old people? Dreadful. Positively furious last night at dinner as Mrs Payne queried had the world web found my work? Replied with much annoyance, distinctly not, however had worked awfully hard all afternoon to catch up. Mrs Payne queried after some silence, by the by, had the world web communicated with me? Bound to say, quite ignored this. Still awfully tired this morning as had worked again after dinner. Went to bed at frightful hour, but have finally caught up. Mrs Payne again asked regards world web communicating with me. Said rather sharply this most ridiculous, could she please stop asking. This taken awfully badly, said was only trying to help. Had mentioned Robert the other day, so presumed wanted to pass on message. Further, world web had said something about Whitchurch, terribly curious, was it not? "Hello Bitty. Tell Robert not to worry about Whitchurch, it's been binned.". Begged Mrs Payne's pardon, might she have told me about this earlier? This apparently most ridiculous, was sure world web talking quite nonsense. Further, what did "binned" mean? "The world web knew all that! Fancy!". "By the by, do you know there's more marks..", had quite shut door in her face. Worked solidly until lunchtime, at which sat in silent annoyance as Mrs Payne said with sorrow, was terribly sorry had lost work, had asked the world web on other half's computer, but didn't answer on where work was. Did I suppose the world web had stolen it? "I say! I think the world web is a scoundrel!". "I can pay! I have seventeen pounds!". Explained in much annoyance that please could she not my computer, frightfully important items for project that did not want to lose. Further, that seventeen pounds mine, perhaps could see about returning it to me? Conversation quickly changed, Mrs Payne said, by the by, the world web had communicated with her! Terribly exciting, as asked who was there, and had said it was Elisabeth Payne. Most curious, as had called her Bitty in reply! Said box of wires ever so clever, could she speak to the world web again? Replied quite distinctly not, and ejecting Mrs Payne from my office chair, said rather sharply not to invade my office again. "Why don't you ask the world web where it is?". Quite ignoring this advice in silent annoyance, stalked back into office to start work again. Was rather grateful this morning to enter office and get some peace and make progress with work. Fearfully busy this week as project deadline on Friday, quite terrible. "Tea lady! Would you like coffee and biscuits?". Thought this most peculiar, queried how had she managed to get serving trolley upstairs? Mrs Payne explained this most easy, item altogether light. By the by, had I noticed some rather large marks on wallpaper previously? "That'll be two pound please.". "Oh, quite right! Two pound fifty, the biscuits are twenty five pence.". "I DO wish he wouldn't do that.". Positively furious yesterday, as having done work and quite overstayed my welcome in deli, was not a glimpse of Mrs Payne returning. Stalked out of the place and set about trying to find Mrs Payne in small cluster of shops. "Why do they call it the world web if no one has it!". Eventually happened upon computer shop, and inside found Mrs Payne in much fluster, exclaiming they must have world web here with all these computer boxes. Shop assistant most patient, said was terribly sorry, was not available for customer use. She might try Internet cafe in town. Mrs Payne most annoyed at this, said did not want Internet, but world web! Might there be a world web cafe also? "Can you give me directions to some world web?". Quite escaped home mid-morning, unfortunately taking Mrs Payne with me. Explained awfully seriously would be working, could certainly not be interrupted. This duly promised, and having found table in deli, set about work, having provided Mrs Payne with suitable sustenance and puzzle book. Had barely opened computer programs on laptop as Mrs Payne interrupted, said was terribly sorry, but had eaten cake already. Ever so small, might she see about getting something else? Replied with some annoyance, by all means, at which Mrs Payne explained by the by, had I any money? Was terribly silly, had left purse at home! Watched for quite some minutes as Mrs Payne acquired a pastry and had lengthy conversation with proprietor. Made fearfully sure about extracting change from Mrs Payne, as had given her twenty pounds. Mrs Payne appeared most surprised at this, said it was barely worth her handing it back, had already put it in her bag! How much had I given her, ten pounds? "Could we buy some world web, for home?". "Can we take the world web with us?". Declared this absolute nonsense, plug positively fine, had merely to put it in wall. As such spent quite some time connecting items for other half whilst she made us tea. Had all perfectly working and set about going to office myself. Had barely sat down when heard call from other half, by the by, Internet would not work, could I help? "I'm using the world web, Robert! I'm a silver skier!". Begged her pardon, but was she not "surfing"? Mrs Payne most confused at this, asked why would one surf a web? Further, she couldn't swim. Positively fearful end to week, so enjoyed rather some peace over weekend. Was looking forward to this continuing into week, however other half said Sunday evening, by the by, had she said she was working from home next week? Replied distinctly had not, and would be terribly busy myself, not a jot of time to help arranging computer and so on. Other half most displeased with this, said was not an idiot, and if needed help, would ask Mrs Payne for assistance. Bound to say I quite scoffed at this, at which Mrs Payne explained machine fearfully easy to use, was just, "a box of wires". "Fearfully easy, Robert! Before you go, do you have any pliers?". "Oh, do stay! We insist!". Thought this rather uncomfortable, but no amount of reasoning as to having work prevailed, as such spent positively ghastly hour as part of the "jolly foursome". Sat quietly, sipping tea, whilst Mrs Payne, Horseface and Mrs Uptight exchanged altogether sarcastic remarks and most worrisome stares. Was certain to be turned into stone at any moment. Each had their own particular favourite, with Mrs Payne saying she did hope Horseface's dogs were quite alright, was she sure it wasn't her own cakes they ate? At this, Horseface said ever so politely, yes, was quite sure, perhaps they were rotten, was rather hard to tell, but sure they were delicious! Mrs Uptight remarked was most surprised to find cake in garden this morning, looked rather like Horseface's, most strange! Following this party returned to silence, with each stone-faced with fury. "Oh. Do stay. We. Insist!". "I say, Robert! Are you eating that cake or shall we frame it!". "Oh! I say! Oh! Savages!". Other half most pleased last night with her cake from Horseface. Said it positively delicious. Replied with disappointment had barely tasted mine before was thrown out of window. Other half said I was a poor dear, all the same, could do with losing a few pounds. Awoke this morning with Mrs Payne baking again. This altogether too much, said if was any more flour on floor would barely see the tiles. Mrs Payne responded this positive nonsense, as bag of flour promptly fell over, tipping flour off table onto my slippers. Mrs Payne thought this most amusing, said did I want sugar and egg also, would make slipper quite edible if baked. "She jolly well chokes on them!". Will surely lock myself in office until ambulance arrives. Sat for quite some moments in silence, as was evidently in danger of stoking the fire, however curiosity ultimately supreme, queried as to whether Mrs Payne's cakes had gone down well? Followed a story from Mrs Payne, most viciously told, that cakes had been presented to Horseface in terribly nice manner, as trying to help tea party run smoothly. This apparently taken rather badly by Horseface, positively cut the cakes, leaving them in kitchen. Some time later Mrs Payne saw to retrieve cakes, only to find had been positively scoffed by Horseface's dogs! At this Mrs Payne said was quite obviously on purpose, jolly well served Horseface right that dogs rather sick. As party ended rather abruptly, Horseface insisted she returned with cakes, Mrs Payne saying had good mind to throw them in her face. "FILTH! ", at which quite snatched cake from my jaws, and opening kitchen window, positively hurled it outside, as I looked on in astonishment as cake disappeared over next door's fence. "Oh no, Robert, that's for your wife.". Mrs Payne carefully packed up her cakes for Horseface's tea party. Bound to say items looked quite frightful. Attributed good deal of Mrs Payne's success on Jubilee to other half and my rather excellent cake making. Mrs Payne's cakes in that instance, as well as largely being eaten herself, typically provided as buttery treat for neighbourhood dogs. Unseen by Mrs Payne, naturally. In fact, saw one boy given awful scolding from mother as his dog having been given one of Mrs Payne's, was promptly sick. Asked Mrs Payne would she require driving to boss and Horseface's home, with response with some aggravation that Horseface had invited Mrs Uptight, as such she would be driving. Said was jolly good had not been involved in argument on Jubilee day regards lawn. Mrs Payne went rather pale at this, asked should she take reconciliatory cake around first? Heart quite jumped at this, said awfully quickly perhaps not, really, perhaps best leave them for later. Yes, later. Certainly. Decided it was time for work. Back to work today and finding it quite insufferable. Most annoying as have constant echo through house "ACHOO! ", followed by sniff, and "What a jolly day!". Came down for lunch and found Mrs Payne in kitchen positively covered in flour again, and making cakes. Begged her pardon, but had eaten quite enough cakes earlier in week, why was she making more? This duly explained as was sure Horseface trying her best, but would not want her to fall short, so would take some cakes along to tea tomorrow, "just in case". Suggested this altogether unnecessary, and was sure Horseface most annoyed at this, knew she was fearfully competitive. This declared positive nonsense by Mrs Payne, her success undeniable, was sure Horseface appreciative. "Should I take twenty four, or thirty?". Mrs Payne positively glowing since her party, most pleased with success. Unfortunately nose glowing most of all, as has fearful cold, presumable due to sitting in rain. All the same, is positively unstoppable in talking about the event. Mrs Payne's flag remains erected in flower pot in lounge. "What a jolly ACHOO! day. To think we ACHOO! had so many people! Did you ACHOO! see Uptight's ACHOO! face?". Mrs Payne most pleased also, as has sparked quite tea party frenzy amongst friends, with Horseface having organised tomorrow's. Said would be terribly nice, but was sure not to be quite level of jollity had for Jubilee. Went on to say had told Horseface was "terribly nice of her to try her best". Sure Horseface positively furious at this! All watched in admiration as Mrs Payne, armed with cakes and wearing her best Sunday hat set off to neighbours' houses. Was apparently most delightful in her manner, as each house kindly took a cake and had little chat, as we heard Mrs Payne laughing in response. At the third house Mrs Payne went to sit down on wall, but stopped herself, and straightening her hat, forged on into neighbourhood. Watching Mrs Payne disappear, we noticed under our umbrellas drizzle had largely stopped, leaving only grey sky above and some darkness. Wiping chairs we all sat, as other half went off to make tea. "I am enjoying the party! ", and helped herself to tea. "I say, Mrs Payne, 'build it, and they will come! ', Field of Dreams!". "Build it, and they will come! Kevin Costner!". Having barely any rest, Mrs Payne got up from table to greet the family. Were decided not the Costners, but all the same, most welcome. Bound to say husband possibly burliest chap had ever seen, with wife quite tiny. Thought him positively fearful at distance, but was awfully nice chap and offered him tea and cake. His wife said had made some sandwiches, and would be bringing them out presently. Their children joined also, instantly attracted to Mrs Payne, giving them each a flag. Seeing the activity, two more families looked out from doorways, and with application of cakes for all and flags for children, Mrs Payne duly grew her little party to four tables, with other families bringing food and chairs. Throughout this Mrs Payne worked tirelessly whilst other half, boss, Horseface and I watched on with pride. Saw once or twice Uptight looking out of window and not ashamed to say gave him rather amused wave. Looked awfully displeased about this and stole away from window immediately. "THEY SAY HAVE YOU GOT ANYTHING OTHER THAN CHRISTMAS MUSIC?". "Uptight is a fearful snob.". Uptight stopped momentarily, visibly shook with rage, and without looking around continued to stalk into house. Mrs Payne said chap was terribly kind, might we get back to party? "I'm sure we'll get some people soon.". "I have cakes! CAN'T THEY SEE WE'VE GOT CAKES!". "I say! What the devil! What have you done to my lawn?! I'm glad your party is a wash out, good riddance to you AND the Queen!". Before had a second to respond, Uptight slammed front door, causing knocker to bounce several times, and we were once more in silence. "I think it's time to go in." "Robert, would you get my Sunday hat and a dozen cakes?". Other half and I ventured into kitchen around breakfast time, and bound to say was most displeased to find kitchen in even worse state. Further, Mrs Payne positively covered in flour, with quantity on my chair. Only realised this having sat down. Mrs Payne most annoyed at complaints on cleanliness, said excess flour only to be expected, in any event, would brush it up and use for next batch. Thinking it altogether wiser if we made cakes, other half suggested we would take over cake making whilst Mrs Payne prepared other items. This duly accepted, Mrs Payne shook quantity of flour from dress, said not to forget the extra butter, and said she was going to put out table. Decided against helping Mrs Payne with table, perhaps not wisest of choice. In free moment between cake batches, looked out from lounge window to find table in middle of road, with Mrs Payne arranging mass of union jacked adorned items. Seeing path on which table arrived there, noticed awful mess of Uptights' lawn, where table legs had left deep grooves of soil through grass where Mrs Payne had evidently dragged table legs. Was sure Uptight would be positively livid at this, waved with amusement at Mrs Payne, who responded with smile and wave of little union jack. Returned some time later to window to find not a soul having joined Mrs Payne, now sat at table, dutifully waving her flag to keep up spirit whilst in centre of table proudly sat five cup cakes, and one screwed up cake case. In meantime, other half and I most pleased as had made positively 50 cakes, with rather little attrition due to "taste tests". Suggested we forge on to create more, as thought of joining Mrs Payne quite frightful. Heard knock at front door some time later, and most pleased to see boss and Horseface having arrived. Had brought with them quantity of bunting from cricket club, was likely enough to cover the whole area. Bound to say boss rather displeased, said was I aware Mrs Payne's table rather in way of road, almost drove into her. Had wound down his window to say as much, to which Mrs Payne greeted him in most jolly mood, gave him a cup cake, explaining it was her last, and rather sternly said would he mind moving his automobile out of the way of the party? Mrs Payne returned to table, placing six new cup cakes in centre of table, and regained her flag waving. Other half, boss, Horseface and I looked on with disappointment. Boss explained had driven past number of parties, looking most jolly by this time, and yet had not a person ourselves. Horesface asked other half rather quietly, would Elisabeth be disappointed? Woken up this morning awfully early with quite clatter from kitchen. Most annoyed at this, went to investigate to find sugar and flour positively covering the place, with Mrs Payne explaining was making cakes for today's Jubilee party. Very excited, said first batch came out of oven while ago, and was having tea break before next batch. Looked upon cup cakes, all rather wonky, but possibly edible at the least. Declared them positive triumph, however might perhaps need more than six? At this Mrs Payne explained in much annoyance was not an idiot, had made eight, however had eaten two during tea break. "Right, more cakes! Where's the butter?". 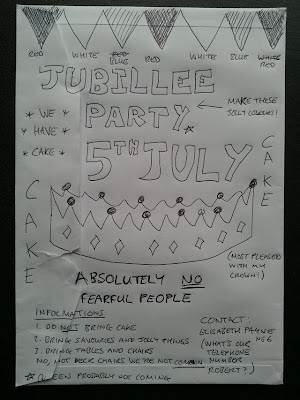 Mrs Payne asked that I provide an invitation to the jubilee party. Thought it terribly amusing to provide the original! Set out myself mid-morning to deliver some flyers for Jubilee party. Pleased to say this rather quicker than Mrs Payne, although had not a jot of intention to delivery all two hundred. Rather, delivered to those on our Close and two adjacent. Most annoyed whilst delivering, as had quite trail of recipients meandering after me with complaint of mistakes and asking most ridiculous questions regards organisation. Said I had not a clue, and should telephone, per flyer, if interested. Thought it most amusing once home to realise had put flyer through Uptights' door also. Bound to say delivery quite mindless as focused on task. Wondered what they would do about it. 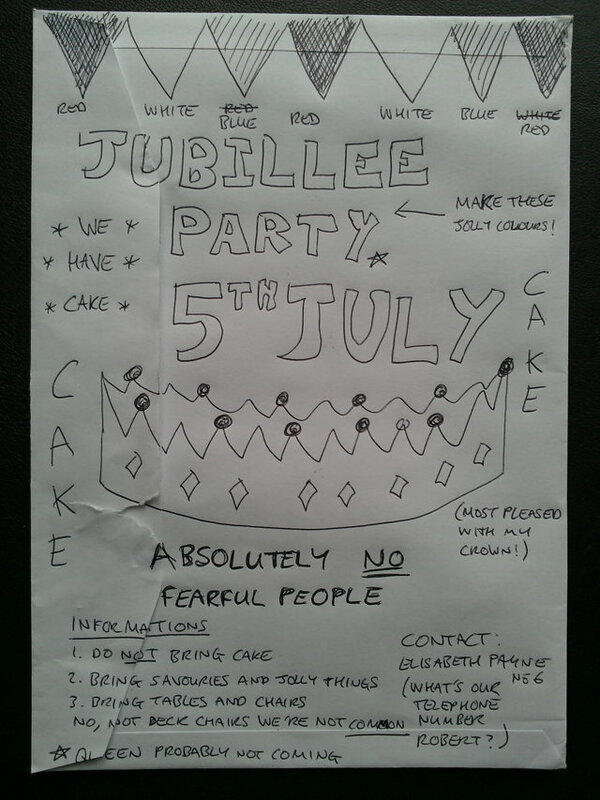 "Will you be coming to our Jubilee Party?". Followed some moments of murmured agreement, at which Mrs Payne exclaimed, "Namaste!" and replaced the receiver. "I DO like telephone surveys!". "Must be a thousand!". Looked at her remaining pile, and quick inspection revealed quite majority still remained. Asked where she had been, and was told with pride number 15! This struck me rather disappointing. We live at number 6. Sandwich having been provided Mrs Payne appeared much improved. Sat in silent fury as Mrs Payne said rather gravely once finished, had some terrible news, would I believe a young hooligan had mugged her, and had off with my flask! Shaking her head, she added, had fought him bitterly for it, was terribly brave, as knew it was mine, but was eventually overpowered, and he got away. Terrible shame. Still, wouldn't ring the police, probably miles away by now. By the by, were no witnesses.